Please note: this is my “usual” schedule. I sub quite a bit! Stay up to date via my Instagram Highlights @pandahamandah ! 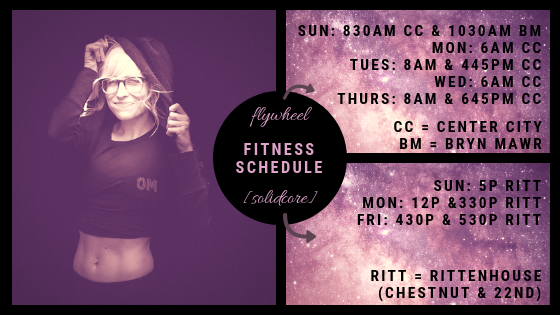 Want to try Flywheel Sports for FREE (regardless of where you are located!)? Use my code "FLY-AMANDA-P" at check-out! VOILA! Your first class is now absolutely free! Hope you see you in the stadium soon! Can be used first-time riders only. Join me for a charity Flywheel class followed by a post-class Yappy Hour with adoptable dogs (!!) and Koia plant-based protein shakes to benefit the PSPCA. Every participant will receive a full-sized Koia shake, goodies from Franklin & Whitman, and will be entered into a drawing for one of three Hidrate Spark Smart Water Bottles. $35: Flywheel Class, Yappy Hour, & all of the above. $55: All of the above + a PSPCA shirt or sweatshirt of your choice. Can’t make it? Donations are also encouraged and appreciated! Live Cooking Demonstration + BYOB Dinner! Join me for a live plant-based cooking demonstration + BYOB dinner at BodyX Fitness & Nutrition in Bryn Mawr! Sit back and enjoy some vino while I prepare dinner in BodyX's state-of-the-art, fully-equipped 14 seat kitchen classroom - with fun tips and nutrition facts along the way! Bonus: the recipes are yours to take home with you! This month's theme: Eat the Rainbow! $75 per person. Space is extremely limited! Reserve your spot now! * Please let me know if you have any allergies before the event! Join me at Sanctuary Yoga & Mindfulness on Saturday, January 27th from 2-4pm as I lead a discussion about the hows and the whys behind transitioning into a more plant-based lifestyle. We'll sample tasty treats while diving into all of your questions, and you'll leave with a few recipes to try on your own! Whether you're looking to shift your entire diet or simply boost your current one with more vibrant and nutrient-packed meals, this workshop will provide you with the basic knowledge and tools to get your started on your plant-based journey. Space is limited! Reserve your spot by calling 215-964-9323 or online at Sanctuary Yoga. $30 Early Bird through 1/20/2018 | $35 Drop-In.